New dental coding guide from ADA! The manual's skimmable format makes it quick and easy to find the ICD-10 code for dental you need! With over 70,000 diagnosis codes condensed down into roughly 750 ICD-10 dental codes that best apply to dentists, organized into 17 sections listing all codes. Includes approximately 750 ICD10 dental codes most applicable to dentistry. 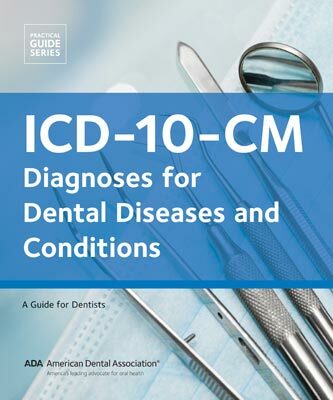 ICD-10-CM: Diagnoses for Dental Diseases and Conditions addresses another HIPAA standard code set that enables recording of diagnostic and descriptive information on patient records and claims. It distills down the nearly 70,000 available codes to approximately 750 that are most applicable to dentistry. These codes and their meanings are presented in 17 separate sections which list individual ICD10 dental codes. This format reflects the various types of patient encounters and clinical conditions that should be considered when treatment planning. The manual's skimmable format makes it quick and easy to find the ICD-10 code for dental you need. Narrows down a total of nearly 70,000 ICD-10 codes and excerpts the nearly 750 that apply to dentistry. Useful to dentists who may bill medical benefits plans or Medicaid, especially if they deal with patients with medical conditions such as pregnancy or diabetes. Allows practitioners to make more uniform diagnoses on patient charts. No more scribbling a diagnosis and having to decode it later. Gives ability to track procedures in your office with machine-readable ICD10 codes. Records medical procedures in paperless or digital office environments.